“Stephane Ratel has confirmed that the Mosler GT3 will be able to race in the European GT3 Championship next year, as long as there are three cars in the first year, and six in the next,” reveals Martin Short. This clarifies the exact position now: it seemed, last week, that any Moslers wouldn’t find a space in the International Championship for 2007 – but now they’ve been formally approved. “Mosler Europe's first three cars are now in build in St.Ives in Cambridgeshire,” adds Martin Short. The GT3 version of the MT900R made its debut at the Britcar 24 Hours – where it very neatly set a qualifying time (1:54.345) almost exactly matching the best times (1:53.3 / 1:53.4) set by the pole position cars at the opening round of the International Championship in May. 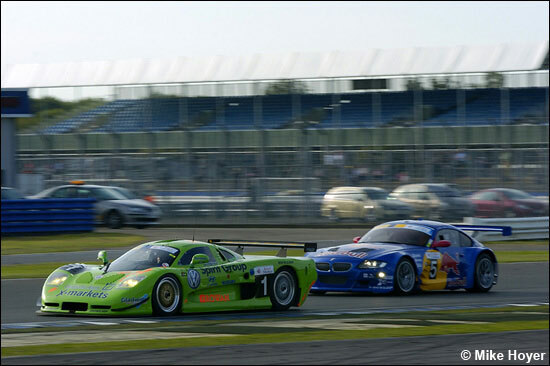 Here's the GT3 Mosler leading the race-winning Duller Motorsport BMW Z4, during the opening laps last Saturday.